Meet the newest member of the Universal+ Series: The indomitable GTS4. Built with the same radical, 3 strut, bridled, C-kite configuration as its forerunner. But now, with more precision; a prodigious operating range; and dare we say, a little more badassery. The 4th generation of the legendary GTS series sports refinements to its Future-C shape, bridles, and construction. Refinements that make the GTS4 more powerful, precise, and responsive. On the rail. In the tube. Or in the air. Experience our interpretation of controlled aggression embodied in: Powerful, controllable, turns with a radius that extends just beyond its wingtips. Superb bar feel by virtue of its shorter Short Bridle System. And unbelievably responsive ExoTex construction. GTS4. Exactly what you would expect from CORE. And a little more. 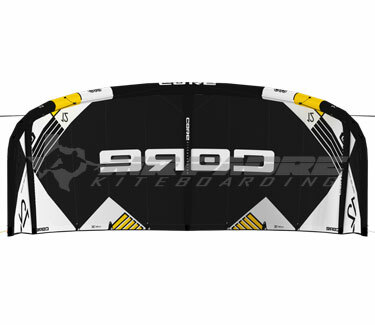 An easy choice for unhooked freestyle, relaxed freeriding, or waves of any size. With its linear and predictable behavior, you might even think the new GTS4 is virtually connected to your cortex. Its signature turns complement any transition and gets you going when that big wave is chasing you down. Try the ultra-agile wave...unhooked...kiteloop machine soon. And unleash your inner freestyle ninja. 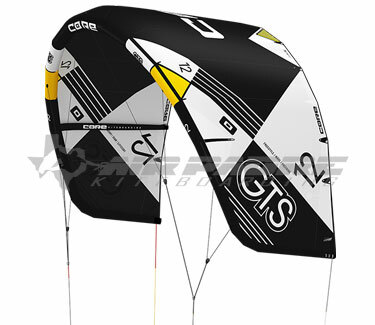 FUTURE-C SHAPE: The Gen4 carries over that familiar GTS C-kite feel that we all have come to love except now it enjoys a little more range on the high end. We added improved back-stall prevention to its smooth and controllable kiteloops. Credit a slightly increased aspect ratio and some other top secret enhancements for the GTS4’s radical versatility. RADICAL REACTION TIPS: The GTS4 inherits cat-like reflexes from its square-ish, ‘C-style’, wingtips. Gen4 refinements include Radical Reaction Tips that are slightly more square and downward sloping towards the trailing edge. EXOTEX®: Made in Germany. And exceptionally durable. ExoTex’s new asymmetrical Dacron weave and emulsion (protective coating) process is specifically developed for our exoskeleton frames to prevent bulging, ripping and UV degradation. The no stretch fabric also improves airflow by permitting reduced leading edge and strut diameters. Despite reducing strut diameters, the more robust ExoTex exoskeleton reduces flutter; improves flight stability and delivers superb rider feedback. CORETEX® Triple Ripstop: Exclusive to CORE. Our, industry leading, triple ripstop canopy fabric is protected and strengthened with three different coating processes called emulsions. CoreTex sets new benchmarks in breaking strength, tear resistance, longevity, UV protection and elongation. Feel the tight, crisp signature only a CoreTex kite can deliver. ULTRASHORT BRIDLE SYSTEM: A little shorter and even sweeter. The un-bowtie-able, two pulley, bridle system is shorter on the new GTS4 which improves bar reaction, feel and positional feedback. And for this kiteloop machine, having precise bar control in your hands is a bonus when you’re blind and upside down. CORE INTELLIGENT TRIM SYSTEM: Kite speed and bar pressure is a matter of choice. Your choice. With fully adjustable back line tension (aka trim), bar pressure and kite turning speed, our quick adjusting trim system gives you the freedom to ride any way you like. But don’t worry, the kite comes out of the bag ready to fly so you can play with the adjustments later.